It has taken some time but finally we have installed 8 new taps in our bar. So as of today we can offer a wider selection of our own beers and beers from other craft brewers. We now have 16 beers on draft including Hop Horn, Odins Tippel, Jaipur IPA,Saw tooth ale, American dream and a greater selection of Schouskjelleren beers. And Amundsen Bryggeri og Spiseri have adjusted their price level, apparently after feedback from their guests. 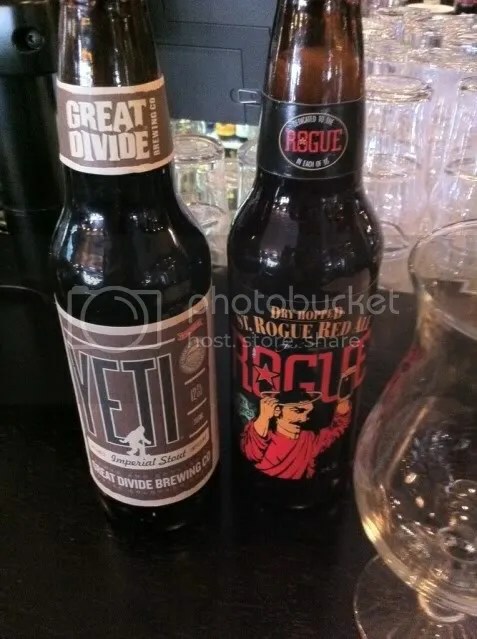 Of particularly great value are their beers of the day. Yesterday they had these two lovelies at 50 kroner a bottle. Avery IPA, too. A bargain – at least around here. No, I’m not dead. It’s just the polar bear. Travelling back through Scotland the tippler stopped off at Morrison’s supermarket in Girvan, an Ayrshire coastal town. With a little while to spare there was time to peruse the beer shelves and the selection of Scottish bottled beers. Using oak to age beer is unheard of. But, the flavours imparted by the oak barrels (previously used to mature bourbon) lend an incredible depth of taste. Think vanilla, toffee and orange aromas, with a malty, lightly oaked palate; soothing and warm in the finish. That is about right. 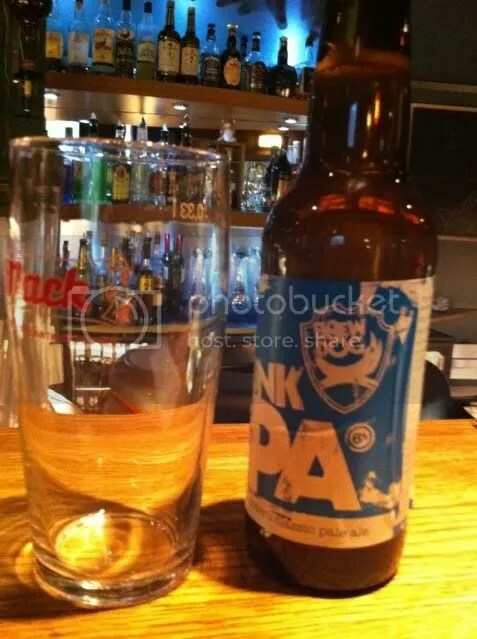 A delightful full flavour with a little bitter kick, smooth and a bit too easy to drink. Great little website to check out, too. OK, so I finally got around to visiting the new brewpub in town, Amundsen Bryggeri og Spiseri, meaning Brewery and Eatery. The Amundsen in the name is of course the polar explorer, but this is not a place with seal fur and the remains of polar bears, it’s just named after the street outside, which is named after Amundsen. So there is no need to stay away, even if you are in the Scott camp in this centennial year. I was there on the opening night, too, but they did not have any of their own beers on as yet, and it was too hot and noisy to get a real feel of the place. I came back on an early afternoon while the World Skiing Championships was still on, and the place was fairly dominated by screens large and small. So, if sports bars are not your thing, one of the identities of this place is precisely that. I had a quick look at the lunchtime menu, which was a bit pricey, edging up towards the 200 kroner mark. 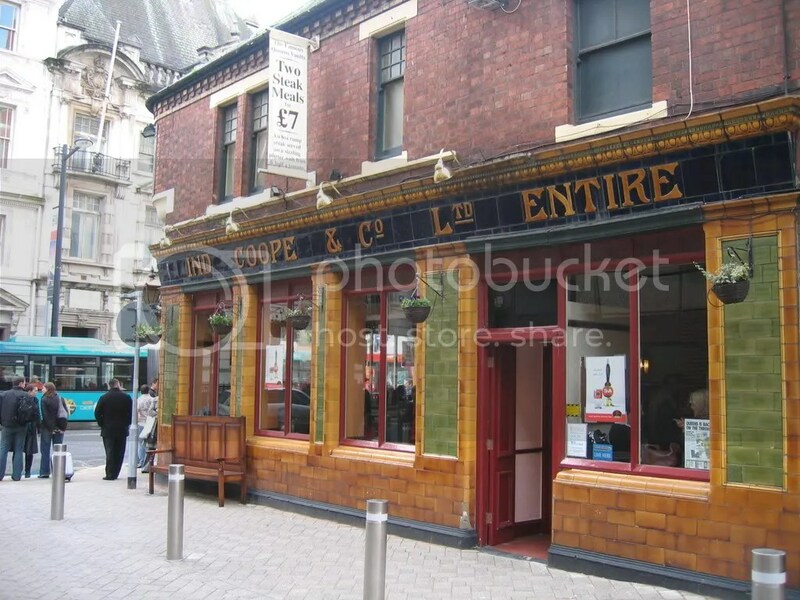 The pub/restaurant is split into several areas, giving a quite intimate feel. You may sit at a table or find a stool at the bar. 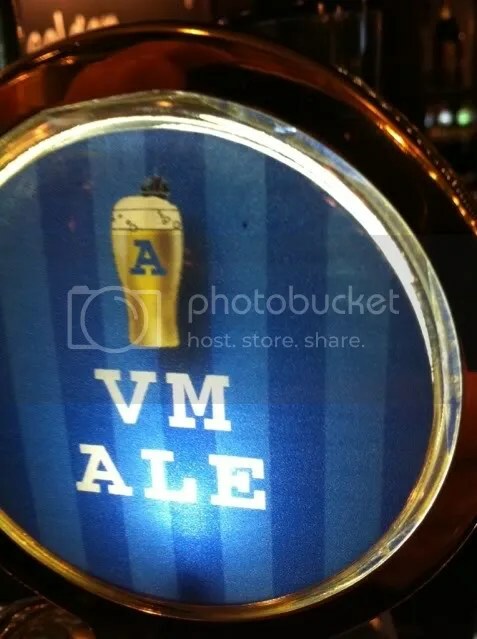 Their two first beers were on, though the VM Ale was almost finished. This was their first brew, and I got the feeling that they had rushed it a bit too much. To much unfermented mash here, some yeast and hops, too, but not properly balanced. I got the feeling that given some more time fermenting and conditioning this would have made a decent pint of bitter. Their pale ale was just released, and that was much better. Not an extreme American variety, but a fine and dry hoppiness made this very moreish. There is a comprehensive printed beer list, which does not include the bottles they have stocked their beer cellar with. Through a glass wall you see the cellar, which includes some interesting Belgians and Danes, various vintages of Thomas Hardy, Fullers Vintage etc. The beer list is a bit more mundane, but it covers the Norwegian micros more comprehensively, and has a strong list of German beers. Keg beers from Handbryggeriet, Ægir and Nøgne Ø, lagers from Hansa, even a few beers from Hansa’s brewpub in Bergen. 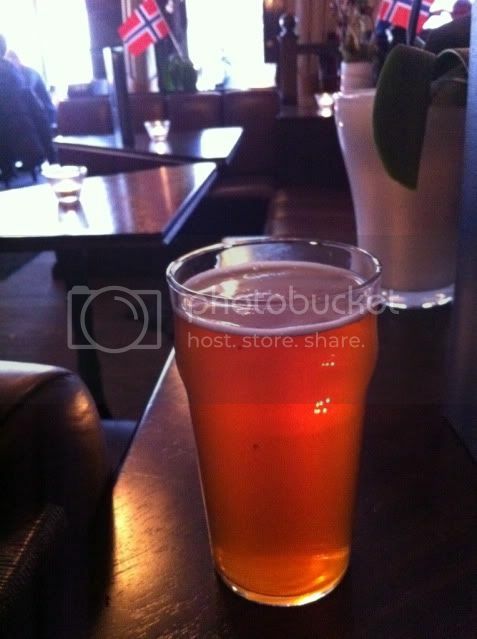 Amundsen has a prime location, close to the National Theatre, City Hall and the rest of downtown Oslo. A new brewpub is always welcome, though I doubt that this will be a regular hangout for me. They will probably aim for several markets at once. It is convenient to meet there for a beer after work and there will be lots of tourists passing by. I’d be surprised if some of the TV screens won’t be showing soccer, it remains to be seen if they will dominate it all. Verdict: Definitely worth checking out, even if it’s not my first choice. In case you don’t get enough around here, there’s a new blog in town. A few of you have been following this blog from its earlier incarnation years and years ago. I even did some brief guest blogging over at Alan’s place. 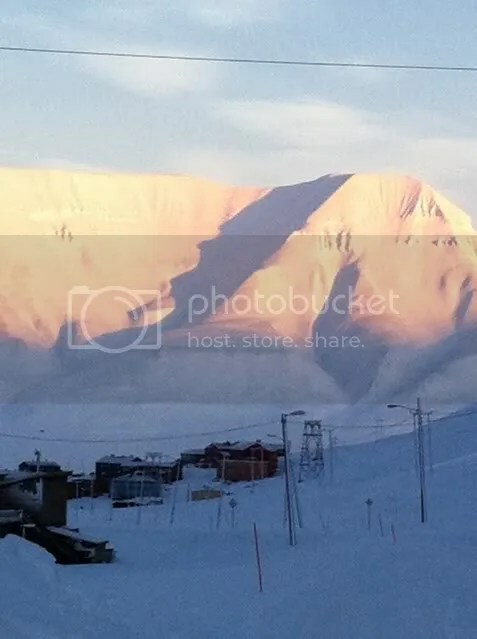 One of the places I covered was Longyearbyen in the Spitzbergen archipelago, halfway between the Northern coast of Norway and the North Pole. Almost two hours flight Oslo- Tromsø, out of the plane to go through Schengen security check, then another hour and a half in the plane. On my previous visit I went during the dark ages part of the year, when the sun is below the horizon. This year we went in mid February. The sun was not yet back in the town, but it shone for some hours every day, giving quite another perspective on the wild landscape. There is a long history behind the settlement in Longyearbyen, starting with whalers and trappers, continuing with the time of the great polar explorers and the developement of a mining town. The area was strategically important during the Cold War – now it is a vibrant community with three legs to stand on – coal mining, tourism and research. There are lots of opportunities for exploring the countryside, but you need to go with an armed guide or be prepared to arm yourself. There have been sightings of polar beers very recently, and they are to be taken seriously. The highlight of our visit was a dog sled excursion arranged by Svalbard Husky, but there are lots of excursions, both summer and winter. The last time I was around, the most inteeresting beer available was Goose Island IPA. Have there been any developments? There is an alcohol monopoly shop in town, Nordpolet, run by the coop supermarket. The beer selection was not up to much, Norwegian macros, Guinness and Corona. The prices are low – but go for a good bottle of wine at duty-free prices instead. Some rare cognacs, too. There is a quota for beer and spirits, but not for table wine, probably a leftover from the mining days. At the Barentz pub in the Radisson Blu hotel, the beer range was better. Mack pilsener and bayer on tap. Nøgne Ø Wit and Porter in bottles. And, here at the Northernmost bar on the planet, BrewDog Punk IPA and Rip Tide. They have truly conquered the world. The Publican reports on Brains of Cardiff, who have stopped brewing their 45 lager because of dwindling sales. What if other breweries did the same and focused on their good beers instead? 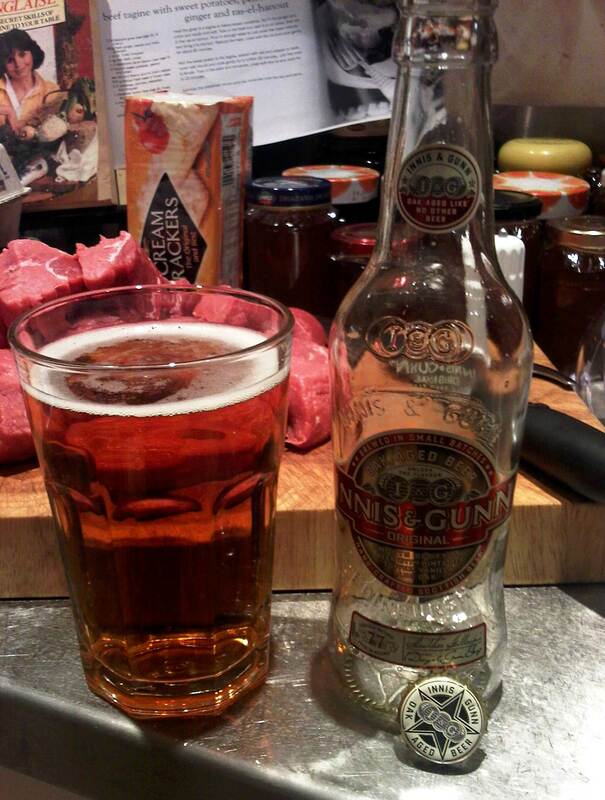 Some of them do – Fuller’s don’t bother brewing their own lager for example.